How can Biennials contribute to a Better World? 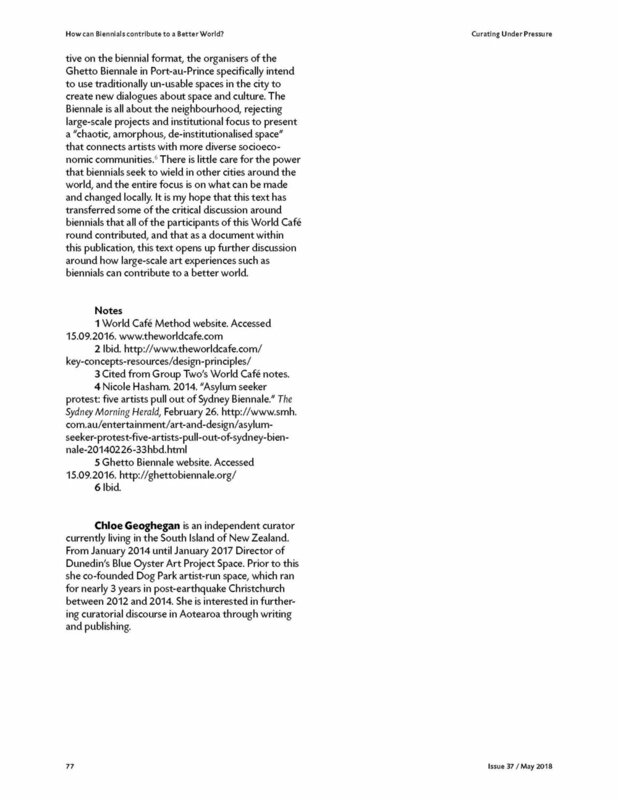 "The symposium Curating under Pressure held in November 2015 in Christchurch, New Zealand/Aotearoa, developed by Elke aus dem Moore and Leonhard Emmerling, asked for art strategies in times of crisis. The symposium focused on the ethics of curating in the biennial business was initiated by ifa and Goethe-Institut, realized in cooperation with Creative New Zealand and the University of Canterbury, and was supported by the Federal Foreign Office of Germany. The symposium outlined two possible states of crisis in a global perspective: the natural disaster—contributions in this publication can be found by Azhari Aiyub, Tim Veling, Chloe Geogeghan, Aaron Kreisler, and Syafiatudina—and states of political pressure—with contributions by Rona Kopeczky, Alisa Prudnikova, Bruce E. Philips, and Elke aus dem Moore. "Chloe Geogeghan’s input describes the World Café workshop processes, especially the discussion on the formats of a Biennale and what it should do to be involved in a more society-focused way, and to include people."